I finally bought a Kindle Paperwhite. I had considered buying an e reader or a tablet for over a year. Now that I have bought my Kindle, I have no regrets. Since most of the books I read are in the public domain, I think the Kindle is a great deal. Anyway, the first story I read on my Kindle was The Strange Case of Dr. Jekyll and Mr. Hyde by Robert Louis Stevenson. It is very difficult to give a review of this novella without giving away too much of the plot. Therefore, there will be spoilers in this review. Mr. John Utterson, a lawyer for Dr. Henry Jekyll, learns from his friend Richard Enfield about the recent murder of a small girl. This small girl was trampled by a frightening-looking man who then escaped from the crime scene. Oddly, Dr. Jekyll offers a large sum of money to the girl’s family to drop the search for the murderer. Over the next few months, Mr. Utterson learns more and more about this sinister man. He discovers that the designated beneficiary in Dr. Jekyll’s will is Mr. Hyde, the same man who had trampled the young girl to death. Here comes the spoiler. Dr. Jekyll and Mr. Hyde are one and the same person. Dr. Jekyll wanted to learn more about his dark and sinister side – the side that he ordinarily represses. Therefore, he prepares and drinks a potion that changes him into Mr. Hyde. This dark side lives selfishly and without morals. Eventually, Dr. Jekyll loses the ability to control the transformations, and it becomes more and more difficult to suppress Mr. Hyde. When Jekyll is asleep or dwells too much on his evil nature, Hyde is released. I know that The Strange Case of Dr. Jekyll and Mr. Hyde is a study of multiple personality disorder. However, upon finishing the novella, I felt that this story was also an allegory on substance abuse. Dr. Jekyll loves and hates Mr. Hyde. He loves Hyde because Hyde does not have to submit to the constraints placed on him by society or a conscience. Also, Jekyll does not have to take responsibility for Hyde’s actions. After all, Hyde is not Jekyll. Hyde is the murderer, not Jekyll. On the other hand, Jekyll has a conscience. He hates what Hyde has done. 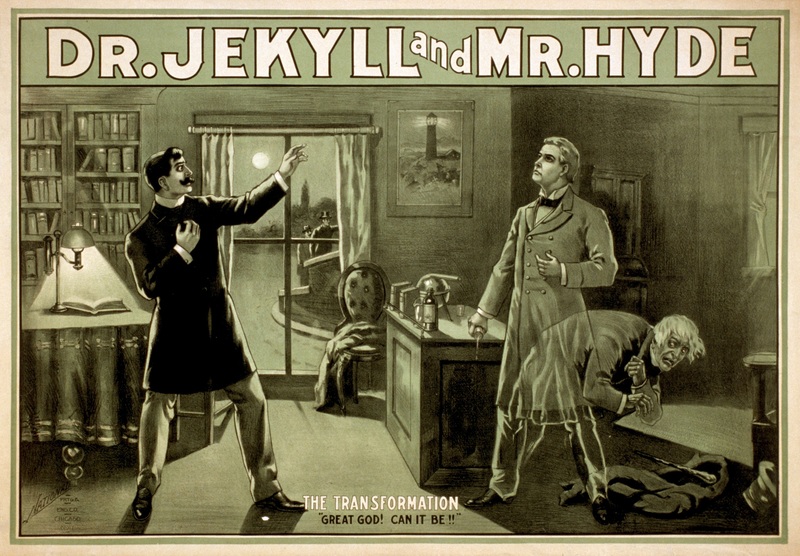 The transformations become more and more spontaneous so that Jekyll loses control over Hyde. Like someone with an addiction, Jekyll cannot be rid of Hyde. Hyde eventually takes over Jekyll. As I was reading the story, it became clear to me that Stevenson had personal experiences with addiction. It is believed that the author used cocaine as he wrote this novella. At that time, cocaine was legal. Stevenson used because he suffered from tuberculosis. One cannot help but pity Jekyll. Jekyll has good intentions. He wants to be himself again, but he just can’t get rid of Hyde. The temptation to evil is too strong, and eventually, Jekyll is permanently replaced by Hyde. I have never read a story that described addiction so accurately. I absolutely loved this story. This is the ideal character study, and Stevenson is such a fantastic storyteller. I know that I will be rereading this novella for years to come.